The Colorado Department of Transportation (CDOT) recently selected three projects across the state that help local agencies fund design, right of way acquisition and construction of stormwater Control Measures/ Best Management Practices (BMPs). 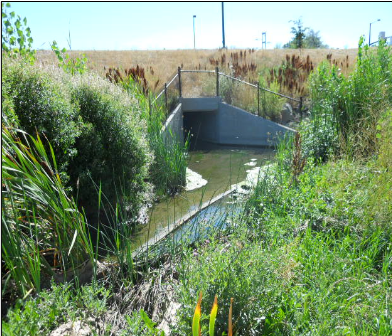 This is part of CDOT’s innovative Permanent Water Quality (PWQ) Program, as outlined in its Municipal Separate Storm Sewer System (MS4) permit that became effective on August 28, 2015. CDOT will contribute $6.5 million annually to a PWQ Mitigation Pool. CDOT’s contribution to the Mitigation Pool, and use of these funds to construct PWQ Control Measures that meet the required Design Standards for stormwater treatment/mitigation, is necessary for compliance. While there are certain Priority Projects that must provide onsite treatment, funding can also be used to support local agency projects that treat a portion of runoff from CDOT owned land (i.e., right of way) within MS4 boundaries. This is an innovative approach that encourages regional Control Measures that are more cost effective and can be maintained more easily than small, geographically dispersed Control Measures. The PWQ Program supports collaboration among partners such as CDOT, local governments and watershed groups. Laura Sneeringer and Jonathan Bartsch from CDR Associates began providing facilitation support four years ago when staff from CDOT headquarters and five regions came together to discuss how to develop a more innovative stormwater management program. At the beginning, there were divergent ideas on how to address stormwater challenges. Laura and Jonathan helped the Task Force come to a consensus decision on an approach they could all support and negotiate with the Colorado Deptartment of Public Health and Environment to develop a final concept. They have continued to support CDOT by facilitating implementation discussions and the first project selection process. They have also had a significant role in documenting decisions through program documents, such as the original concept, guidance for the interim and final program and application guidance for local agencies. Final approval of the PWQ Program via the MS4 permit and selection of the first round of projects is a significant milestone after years of refining the program. It’s also a milestone nationwide as it could serve as an example for other states. For more information, please contact Laura or Jonathan and visit the CDOT PWQ Program website.